Me and some of my friends were planning a Holi get together and when Samosa came up on the menu i jumped upon the opportunity to make it. After making kachori of ICC this month i really wanted to try samosa too. I tried the below Sanjeev Kapoor's recipe this time and must say it was better than my previous experiments. Filling was good but the the pastry/khol though flaky but was not perfect. 1. Mix the flour, salt and oil till crumbly. 2. Add water little by little, kneading into soft pliable dough. 3. Cover with moist cloth, keep aside for 15-20 minutes. 1. Heat 3 tbsp. oil, add ginger, green chilli, garlic, coriander seeds. 2. Stir fry for a minute, add onion, saute till light brown. 3. Add coriander, lemon, turmeric, salt, red chilli, garam masala. 4. Add potato cook for 2 minutes and keep aside to cool. 1. Need the dough again and pinch a golf ball size dough. 2. Make a thin 5" diam. round with some dough. 3. Cut into two halves and run a moist finger along diameter. 4. Join and press together to make a cone. 5. Place a tbsp. of filling in the cone and seal third side as above. 6. Make five to six. 7. Put in hot oil, deep fry on low to medium till light brown. 8. Drain and serve with tamarind chutney. Wow Nisha, the samosas are looking tempting... wish I was invited for the holi g2g!!! SK's recipes are simply awesome!!! 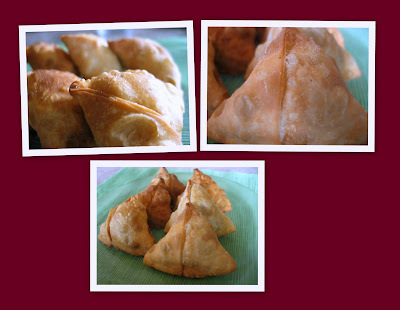 Nice and delicious samosa..come out really well..lots of hard work!! love the crispy and tasty samosa..too good. looks so crispy and yummy..simply superb!! Very nice looking samosas. They turned up too well. Thanks for sharing. Lovely.. that looks real good. Samosas look gr8! Perfect to go with hot tea in the evening! wonderful recipe! thanks for stopping by my blog. stone flower is indeed a unique spice. Actually I have run out of it! First time to ur space and loved the easy and good recipes. Following u to enjoy them instantly as u post. Samosa looks perfect.